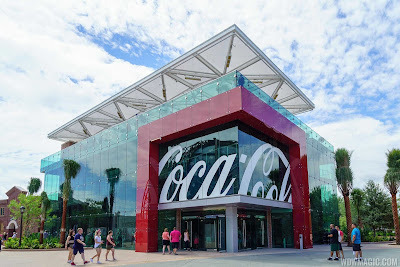 During our visit to Disney Springs, Florida we couldn't resist a look around the immense Coca-Cola Store. For those of you who don't know, Disney Springs (previously called Downtown Disney) is a shopping, dining and entertainment complex, it underwent extensive redevelopment starting in 2013 and was officially renamed Disney Springs in 2015. Also renowned as the home of Bibbidi Bobbidi Boutique. As well as the new shopping area with high-end stores selling fashion, jewellery and make-up brands, they kept the old "quayside" refered to as "The Marketplace", this is styled on 1930's America and is home to the very popular Disney merc stores and old time favourite food outlets, including my MUST pitstop - The Earl of Sandwich! We enjoyed a wander round one hot afternoon and were keen to get into the new Coca-Cola store. This is a clean and modern store, faced in glass and covering 3 floors. Although there's lift (or elevator I should say) facilities inside, they also have a quirky sloped walkway which goes around the edge of the store, between the building and the glass facade. The girls, of course, wanted to walk up the slope to each level. The first two levels in the store were full of Coca-cola merchandise, we just HAD to make a couple of purchases! Well, it would be rude not to. 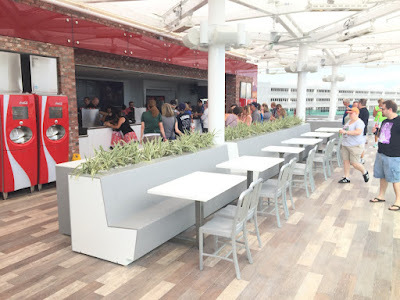 On the top floor you will find the rooftop cafe or beverage bar as they call it, we headed up here to grab a drink. The Beverage Bar serves a wide range of drinks, their main feature obviously being Coca-Cola products. Chris had already had a little look into the new store online and had read about their Coca-Cola Tastes of the World taster tray. These feature either International flavours for $8 or a float tray priced at $8.50, or you can go for the combo tray at $14 which has all of these. No question, we went for the combo tray. The International flavours tray contains 16 different drinks, ranging from well-known flavours to the more unusual (yes the infamous Beverley was there!) Many of the different flavours can also be sampled for free in Club Cool, Epcot. The drinks are arranged on trays with a number assigned to it, along with this you get a drinks guide. This tells you the name and the country where it is sold. Mollie acted as our "Coca-Cola Guide!" The Float tray contained 8 different drinks, these had the flavours written on the tray. We had a pretty refreshing time sampling the different drinks, my favourite was Inca Kola from Peru, Chris quite liked the Thums Up from India and the girls just couldn't decided! I did find the floats a bit sickly but then after sampling all the flavours perhaps I was just a bit Coca-Cola'd out! Chris and the girls LOVED all the samples and made sure we didn't leave a drop! As we left the store we noticed that they sold Surprise bags, these were priced at just $1.99! So we treated the girls to one each and they eagerly opened them once we were outside. A Coca-Cola lanyard with a bottle opener and clip on the end. They have since filled this with keyrings! Make sure you check out the Coca-Cola store when you visit Disney Springs! NOTE: all prices shown are correct at time of publishing and are also subject to sales tax.